After 7 hours of hand-knitting, plus an hour to shrink and shape the felt, why would I bother with yet another hour of hand-sewing a ribbon lining?Comfort, quality and longevity!Although I have sold a fair number of felt hats without any sort of headband liner, many folks find that the satin lining is simply more comfortable to wear against their skin. Especially if worn during physical activities, such as hiking, skiing, or skating, the satin ribbon lining can help eliminate that itchiness that wool sometimes presents to sensitive skin.Additionally, the felt has a tendency to stretch and relax a bit with use, so the non-stretchy satin headband also helps to maintain the hat’s shape and size over time.And, too, the ribbon lining really does give the hat a nice, finished feeling, which helps the hat glide on and off your head easily and comfortably.So, there you have it… satin ribbons really do finish felt hats with flair! 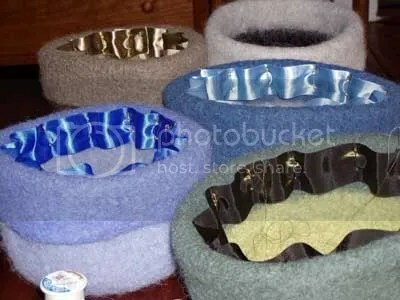 This entry was posted in Demonstration, Fine Craft and tagged Art-to-wear, Demonstration, Fine Craft, hand sewing, headband, itchiness, lining, ribbon, wool by Carrie Cahill Mulligan. Bookmark the permalink.